Yesterday, Big Brother was in a swim meet. His first. Long before the meet, Husband and I were well aware that Big Brother didn’t have much aggression in him. He plays baseball and soccer. Basketball and flag football. He also plays golf and takes sailing lessons. Interestingly, he approaches all these sports with the same manner. He’s social. He’s willing to learn He’s a deep thinker. But, aggressive? Not so much. And thinking, while an excellent quality when reading the wind in sailing or the greens in golf, isn’t necessarily the first attribute required for football. He’d sooner keep his hands planted firmly in his pockets and happily root from the sidelines than get in there and rip a flag off a runner’s belt. He wants to win, don’t get me wrong. He hates losing. But, he doesn’t want to get in there and really FIGHT for it. In Big Brother’s mind, if there’s another guy on the team who’s more QUALIFIED to rip off that flag, well then why in the world would Big Brother go in instead? See what I mean? Logical, yes. Aggressive? Not so much. But, he’s always been a very capable swimmer. A kid who grew up around boats and water, he’s been in the ocean and in pools his whole life. He’ll fearlessly race into the ocean at the first signs of spring (despite bitter temperatures) to become a founding member of what his uncle and Dad refer to as the “Polar Bear Club.” He loves it. So, when the opportunity arose to enter him in a Swim Meet, I figured that chances were he’d be just fine. A little overwhelmed by large crowds and booming microphones in the beginning, he shied from the get go and wouldn’t get in the water for practice. But, after some coaxing from his best friend and the swimming coach, in he went. With his usual careful and precise swimming stroke, he warmed up beautifully. Calm. Cool. Precise. Calm. Precise. Yup, that’s Big Brother. Water splashing everywhere. 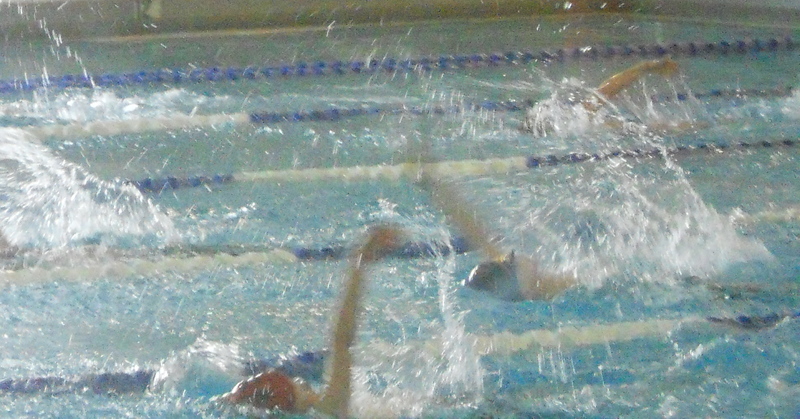 Kicks and reaches, pulls and gasps for breath throughout the pool. Anxious Moms scan the lanes. And there’s Big Brother. Looking excellent. After each race, there were lots of people around the pool heaping praise on him for a job well done. Big Brother beamed. Not at all phased by where he placed in the race. Completely oblivious. He swam well. He was proud of himself. And I was proud of him, too. And, I’ll tell you this, folks. Afterwards? 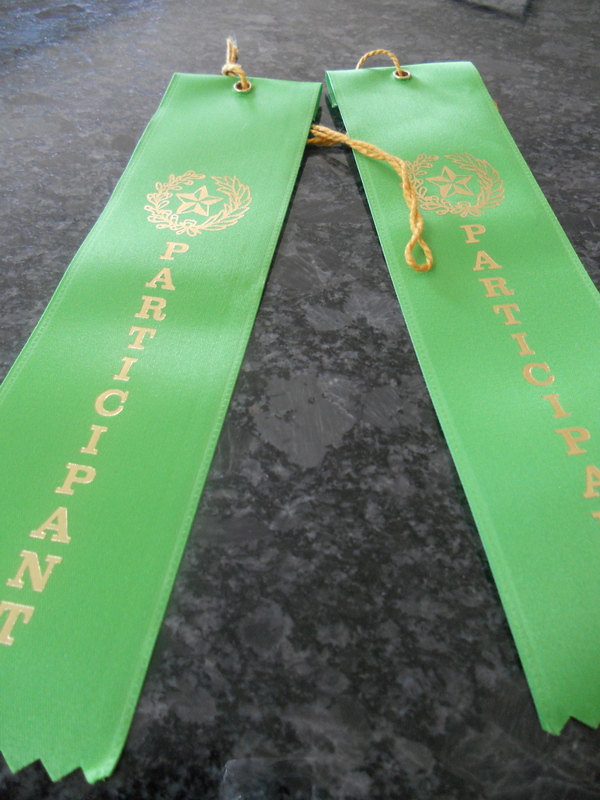 I was damn grateful for that Participant ribbon. I think we just need a balance. Sometimes it’s nice to be rewarded for just showing up and doing our best. But you little guy knows he’s not the best, and he’s okay with that. That ribbon didn’t take anything away from him. Quite the contrary. It may make him want to do it again and try even harder. Nice piece. I keep checking in to see if you are stirring. Hope all is well with you. I miss your writing. I’m not giving up. Surely you’ll check in and see I miss your writing. Whatever you are doing instead, hope it is wildly fulfilling!